Update: During the iPhone 6S and 6S Plus announcements, Phil Schiller mentioned Live Photos will also be heading to the Apple Watch. What are they? Well, by using 3D Touch, a new "multitouch" experience that's pressure sensitive and basically a version of Force Touch, you can press photos and make them move. The camera on the new phones and iOS 9 will take a photo a second before and after the actual photo allowing it to animate - almost like a GIF. 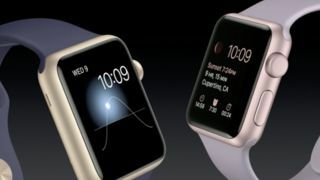 Apple Watch started off the big Apple event today with the company announcing a bunch of new Watch designs and finally telling us that the release date for the highly anticipated watchOS 2 is September 16. Gold and rose gold in ionized aluminum, new Sport bands that are priced the same as current models and a stainless steel Watch with red band. The sizes of the cases will stay at 38mm and 42mm. Apple has also partnered with luxury goods brand Hermés to make new straps for the Watch including one that wraps twice around the wrist, a cuff and a single strap with all three made of hand-stitched leather that "ages well over time." New models from the fall collection are shipping today. Many apps and features were previously announced in June but Apple detailed more today including a few new ones. Facebook Messenger, iTranslate, a GoPro remote app and AirStrip are now on the Watch. With Messenger, you'll be able to actually text, send audio and share locations opposed to simply reading messages. If traveling, you can use iTranslate by speaking to your Watch which will then translate into over 90 languages. GoPro cameras can be mounted wherever you want because the Watch can act as a viewfinder. Health was also a big deal during the event - the Airstrip app will let doctors better communicate with patients by allowing them to send messages and see EKGs in real time, or past charts by simply turning the Digital Crown.